The goal was to go for dim sum for lunch today but my friend wanted to try Honey Pig Korean BBQ. Since we were headed out to Ellicott City I suggested we check out the new Lotte Asian Grocery that is having its Grand Opening weekend. 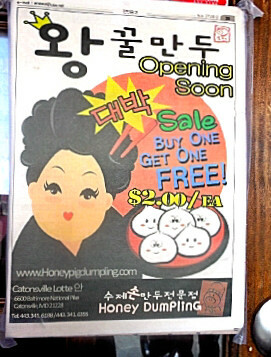 One reason to stop was Honey Pig was opening a dumpling stand inside Lotte which is located in the old Toys R Us location at Route 40 and Nuwood Drive. It had the new store feel; fresh, clean and vibrant. I enjoyed taste testing all the foods being sampled and walked away with a fresh seafood noodle soup for the home fridge.